In this tutorial, you'll build a Windows Presentation Foundation (WPF) app that uses Azure Cognitive Services for text translation, language detection, and spell checking with a single subscription key. Specifically, your app will call APIs from Translator Text and Bing Spell Check. What is WPF? It's a UI framework that creates desktop client apps. The WPF development platform supports a broad set of app development features, including an app model, resources, controls, graphics, layout, data binding, documents, and security. It's a subset of the .NET Framework, so if you have previously built apps with the .NET Framework using ASP.NET or Windows Forms, the programming experience should be familiar. WPF uses the Extensible app Markup Language (XAML) to provide a declarative model for app programming, which we'll review in the coming sections. This list includes the Cognitive Services used in this tutorial. Follow the link to browse the API reference for each feature. Translator Text Get Languages Retrieve a complete list of supported languages for text translation. Translator Text Translate Translate text into more than 60 languages. Translator Text Detect Detect the language of the input text. Includes confidence score for detection. Bing Spell Check Spell Check Correct spelling errors to improve translation accuracy. An Azure Cognitive Services subscription. Get a Cognitive Services key. We recommend creating the subscription in the West US region for this tutorial. Otherwise, you'll need to change endpoints and regions in the code as you work through this exercise. The first thing we need to do is set up our project in Visual Studio. Open Visual Studio. Then select File > New > Project. In the left panel, locate and select Visual C#. 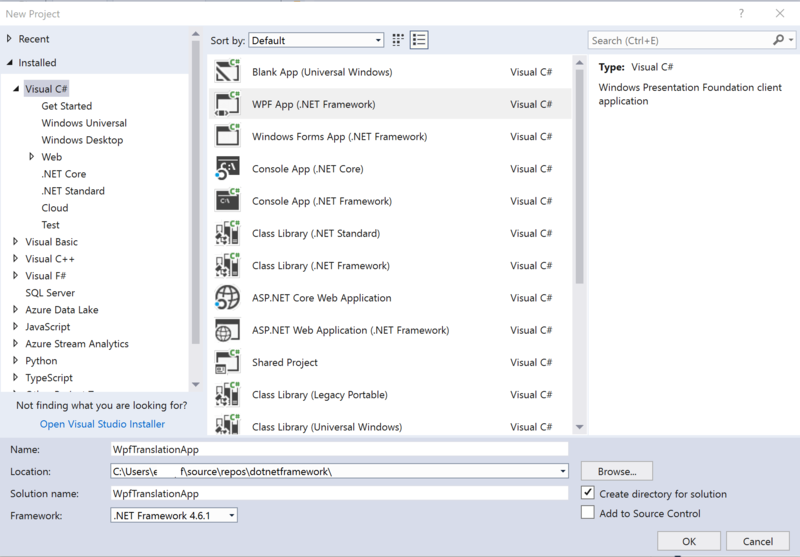 Then, select WPF App (.NET Framework) in the center panel. Name your project, set the framework version to .NET Framework 4.5.2 or later, then click OK. Your project has been created. You'll notice that there are two tabs open: MainWindow.xaml and MainWindow.xaml.cs. Throughout this tutorial, we'll be adding code to these two files. The first for the app's user interface; the latter for our calls to Translator Text and Bing Spell Check. In the next section we're going to add assemblies and a NuGet package to our project for additional functionality, like JSON parsing. Our project requires a handful of .NET Framework assemblies and NewtonSoft.Json, which we'll install using the NuGet package manager. Let's add assemblies to our project to serialize and deserialize objects, and to manage HTTP requests and responses. Locate your project in Visual Studio's Solution Explorer (right panel). Right click on your project, then select Add > Reference..., which opens Reference Manager. After you've added these references to your project, you can click OK to close Reference Manager. If you'd like to learn more about assembly references, see How to: Add or remove reference using the Reference Manager. Our app will use NewtonSoft.Json to deserialize JSON objects. Follow these instructions to install the package. Locate and select the Browse tab. Type NewtonSoft.Json into the search bar. When the installation is complete, close the tab. To use your app, you're going to need a user interface. Using XAML, we'll create a form that allows users to select input and translation languages, enter text to translate, and displays the translation output. Let's take a look at what we're building. 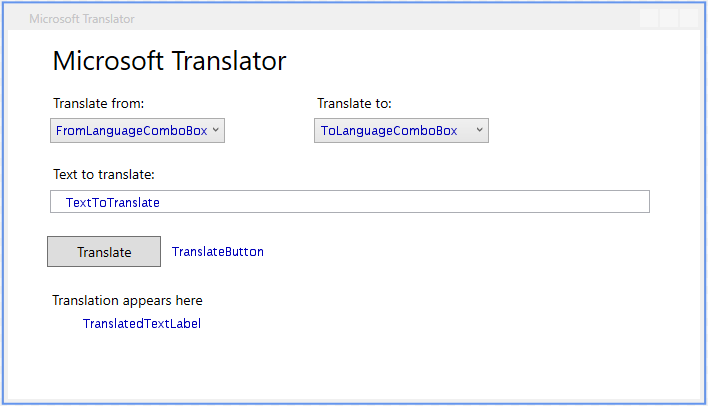 FromLanguageComboBox ComboBox Displays a list of the languages supported by Microsoft Translator for text translation. The user selects the language they are translating from. ToLanguageComboBox ComboBox Displays the same list of languages as FromComboBox, but is used to select the language the user is translating to. TextToTranslate TextBox Allows the user to enter text to be translated. TranslateButton Button Use this button to translate text. TranslatedTextLabel Label Displays the translation. DetectedLanguageLabel Label Displays the detected language of the text to be translated (TextToTranslate). We're creating this form using the XAML source code, however, you can create the form with the editor in Visual Studio. Let's add the code to our project. In Visual Studio, select the tab for MainWindow.xaml. Copy this code into your project and save. You should now see a preview of the app's user interface in Visual Studio. It should look similar to the image above. That's it, your form is ready. Now let's write some code to use Text Translation and Bing Spell Check. Feel free to tweak this form or create your own. MainWindow.xaml.cs contains the code that controls our app. In the next few sections, we're going to add code to populate our drop-down menus, and to call a handful of API exposed by Translator Text and Bing Spell Check. When the program starts and MainWindow is instantiated, the Languages method of the Translator Text API is called to retrieve and populate our language selection drop-downs. This happens once at the beginning of each session. When the Translate button is clicked, the user's language selection and text are retrieved, spell check is performed on the input, and the translation and detected language are displayed for the user. The Translate method of the Translator Text API is called to translate text from TextToTranslate. This call also includes the to and from languages selected using the drop-down menus. The Detect method of the Translator Text API is called to determine the text language of TextToTranslate. Bing Spell Check is used to validate TextToTranslate and adjust misspellings. All of our project is encapsulated in the MainWindow : Window class. Let's start by adding code to set your subscription key, declare endpoints for Translator Text and Bing Spell Check, and initialize the app. In Visual Studio, select the tab for MainWindow.xaml.cs. Replace the pre-populated using statements with the following. // authentication options, see: https://docs.microsoft.com/azure/cognitive-services/authentication. // In the following sections, we'll add code below this. Add your Cognitive Services subscription key and save. languageCodes Array of strings C aches the language codes. The Translator service uses short codes, such as en for English, to identify languages. languageCodesAndTitles Sorted dictionary Maps the "friendly" names in the user interface back to the short codes used in the API. Kept sorted alphabetically without regard for case. Then, within the MainWindow constructor, we've added error handling with HandleExceptions. This ensures that an alert is provided if an exception isn't handled. Then a check is run to confirm the subscription key provided is 32 characters in length. An error is thrown if the key is less than/greater than 32 characters. If there are keys that are at least the right length, the InitializeComponent() call gets the user interface rolling by locating, loading, and instantiating the XAML description of the main app window. Last, we've added code to call methods to retrieve languages for translation and to populate the drop-down menus for our app's user interface. Don't worry, we'll get to the code behind these calls soon. The Translator Text API currently supports more than 60 languages. Since new language support will be added over time, we recommend calling the Languages resource exposed by Translator Text rather than hardcoding the language list in your app. In this section, we'll create a GET request to the Languages resource, specifying that we want a list of languages available for translation. The Languages resource allows you to filter language support with the following query parameters: transliteration, dictionary, and translation. For more information, see API reference. // Additional languages are provided in the full JSON output. From this output, we can extract the language code and the name of a specific language. Our app uses NewtonSoft.Json to deserialize the JSON object (JsonConvert.DeserializeObject). Picking up where we left off in the last section, let's add a method to get supported languages to our app. In Visual Studio, open the tab for MainWindow.xaml.cs. The GetLanguagesForTranslate() method creates an HTTP GET request, and uses the scope=translation query string parameter is used to limit the scope of the request to supported languages for translation. The Accept-Language header with the value en is added so that the supported languages are returned in English. The JSON response is parsed and converted to a dictionary. Then the language codes are added to the languageCodes member variable. The key/value pairs that contain the language codes and the friendly language names are looped through and added to the languageCodesAndTitles member variable. The drop-down menus in the form display the friendly names, but the codes are needed to request the translation. The user interface is defined using XAML, so you don't need to do much to set it up besides call InitializeComponent(). The one thing you need to do is add the friendly language names to the Translate from and Translate to drop-down menus, this is done with the PopulateLanguageMenus() method. This method iterates over the languageCodesAndTitles dictionary and adds each key to both menus. After the menus are populated, the default from and to languages are set to Detect and English respectively. Without a default selection for the menus, the user can click Translate without first choosing a "to" or "from" language. The defaults eliminate the need to deal with this problem. Now that MainWindow has been initialized and the user interface created, this code won't run until the Translate button is clicked. Now we're going to create method to detect the language of the source text (text entered into our text area) using the Translator Text API. The value returned by this request will be used in our translation request later. This method creates an HTTP POST request to the Detect resource. It takes a single argument, text, which is passed along as the body of the request. Later, we when we create our translation request, the text entered into our UI will be passed to this method for language detection. Additionally, this method evaluates the confidence score of the response. If the score is greater than 0.5, then the detected language is displayed in our user interface. Now we're going to create a method to spell check our source text using the Bing Spell Check API. This ensures that we'll get back accurate translations from Translator Text API. Any corrections to the source text are passed along in our translation request when the Translate button is clicked. The last thing that we need to do is create a method that is invoked when the Translate button in our user interface is clicked. The first step is to get the "from" and "to" languages, and the text the user entered into our form. If the source language is set to Detect, DetectLanguage() is called to determine the language of the source text. The text might be in a language that the Translator API doesn't support. In that case, display a message to inform the user, and return without translating the text. If the source language is English (whether specified or detected), check the spelling of the text with CorrectSpelling() and apply any corrections. The corrected text is added back into the text area so that the user sees that a correction was made. The code to translate text should look familiar: build the URI, create a request, send it, and parse the response. The JSON array may contain more than one object for translation, however, our app only requires one. After a successful request, TranslatedTextLabel.Content is replaced with the translation, which updates the user interface to display the translated text. That's it, you have a working translation app built using WPF. 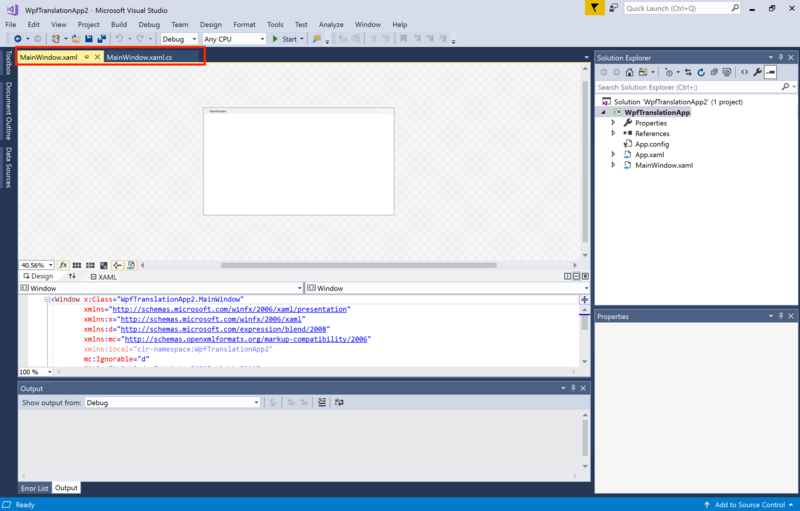 To run your app, click the Start button in Visual Studio.